In July 2015, PHE together with SAPHNA hosted the School Nurse International Conference (SNIC 2015. Over 300 delegates from across the globe gathered in Greenwich for a spectacular 4 day conference, focussing on on the public health of children and young people. The conference addressed all of the key public health issues including; obesity, smoking, mental health and health protection. Delegates also focussed on gritty, raw and sensitive issues including; FGM, CSE and complex vulnerability. The conference hosted an incredible line up of expert speakers whom provided a wealth of international evidence, data and research, fabulous practitioners shared examples of excellent practice and young people shared their lived experiences. Listening to and active engagement of children and young people is fundamental to school nursing services, so giving children and young people centre stage every day was so important. The visibility of young people throughout the week was a talking point and constant reminder of why we were there, why we care so much and what really matters to young people. Young people told us how as public health nurses we can make a different to their lives and but they also shared how they can make a significant contribution to other young people's health and the wider community through fascinating intergenerational projects. Every conference needs a showstopper or USP, without a doubt the young people's contribution most definitely exposed us to a kaleidoscope of emotions. 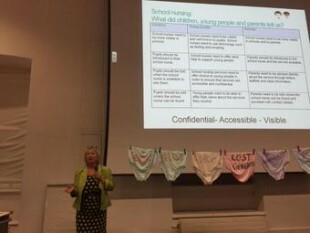 The 'what's pants' approach ensured delegates understood the negative stereotypical media portrayal of young people and how young people feel about this. The school nurse song (add link to Jill Fraser song) lifted spirits, illustrating the dynamic and far reaching nature of school nursing. Clearly school nursing is a modern workforce putting children and young people upfront and indeed very central. Today, we are keen to focus on how young people can take a lead in supporting wider community health and wellbeing (add link or title to Jill Fraser blog) and how active engagement of young people can be achieved. Please take time to read Cecelia’s and Leon’s blogs on their experience of the School International Conference. You can also find the poignant ‘Fixers’ film Leon co-produced to raise awareness of young people’s mental health. We have great pleasure in providing you with the link to the very uplifting rendition of the school nurse song performed live at the SNIC 2015 (Kissing it Better School Nurses song) - which clearly illustrates the extension role and contribution school nursing teams make. Enjoy and please share! A special thank you to Sharon White and SAPHNA our co-hosts of the event, also a huge thanks to Youth Foria (NWRYWU), the Diana Awards, NHS Youth forum, DFiD FGM Youth panel and Kissing it Better for the young people's Engagement and to Liz Harding and Jill Fraser for their expert co-ordination!